"By 1925, the historic Hathaway Stable was in a 'dilapidated' state, contrary to the once thriving business operated by George H. Hathaway in the mid-1890s as a 'Livery, Sale and Boarding Stable' which also provided hacks and carriages to meet all trains, as well as transportation for parties, weddings and funerals. The carriages and horses were also used to move furniture. The stable was rebuilt after a devastating fire in October 1899. It fell into disrepair again when a portion of the roof collapsed under the weight of snow in February 1920 following a severe storm. Damage was set at $15,000 and the building was never fully repaired. The building was purchased by William Curley in November 1920. 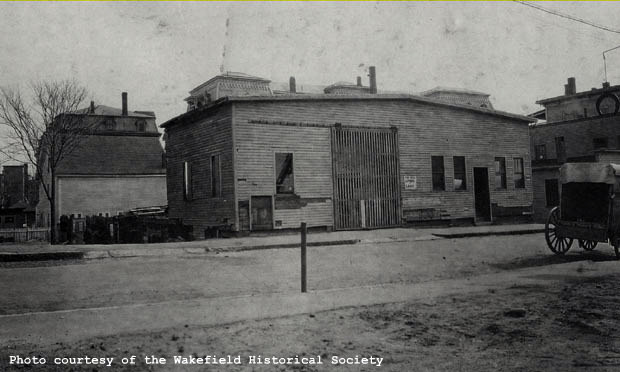 Firefighters eventually shored up the walls to make the building safe for the 'children who used the building as a playground' and for the Wakefield Fife and Drum Corp who leased a portion of the building for its rehearsals. Although the Selectmen requested that the building be removed in September 1923, it was still standing in 1925." - Text from calendar by Jayne M. D'Donofrio. “Hathaway Stable, Mechanic (Princess) Street, April, 1925,” NOBLE Digital Heritage, accessed April 20, 2019, https://digitalheritage.noblenet.org/noble/items/show/6976.